Residents are questioning whether escape routes and fire prevention measures were "adequate" at a block of flats where a fire claimed six lives. Three young children and three adults where killed in the fire at the 12-storey Lakanal Flats, in Camberwell, south-east London, on Friday evening. Several residents said the complicated layout of the flats in Havil Street made evacuation difficult. 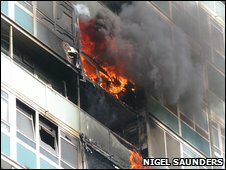 Ed Hammond, a seventh-floor resident, described the flats as "death traps". He said: "If the fire is in the central area, you would virtually have nowhere to go. 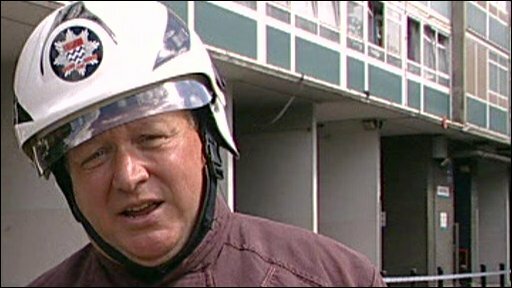 Nick Collins, Fire Brigade: "We're reasonably confident it started on the ninth floor"
"I hate it," he said. "It's the safety, it's just not right." Zahera Chaudry, 21, whose sister was forced to flee her first-floor flat with her three children when smoke came into her living room, said: "These buildings should have been torn down years ago. Now look what's happened." She said there was no central fire alarm system in operation but some of the individual flats were fitted with alarms. Carol Cooper, 38, who lives on the seventh floor, said the tenants had called for the block to be demolished three years ago. But she said they had been told the block was a listed building, one of the earliest council houses in south-east London, and could not be knocked down. There was no immediate independent confirmation of this information. Harriet Harman, the area's MP, said there would have to be a thorough investigation into the cause of the fire and whether the prevention was adequate. "There are many blocks with one central stairwell and questions will have to be asked about what happens when a fire breaks out," she said.